Build a robust Food Safety Plan by having access to all the hazards and food fraud incidents in the global supply chain. Get access to all the data that you need to review the food safety history and to evaluate the performance of your suppliers. FSMA Preventive controls for Human Food requires hazard identification, which must consider known or reasonably foreseeable biological, chemical, and physical hazards. The main goal is to identify the hazards that require preventive measures. 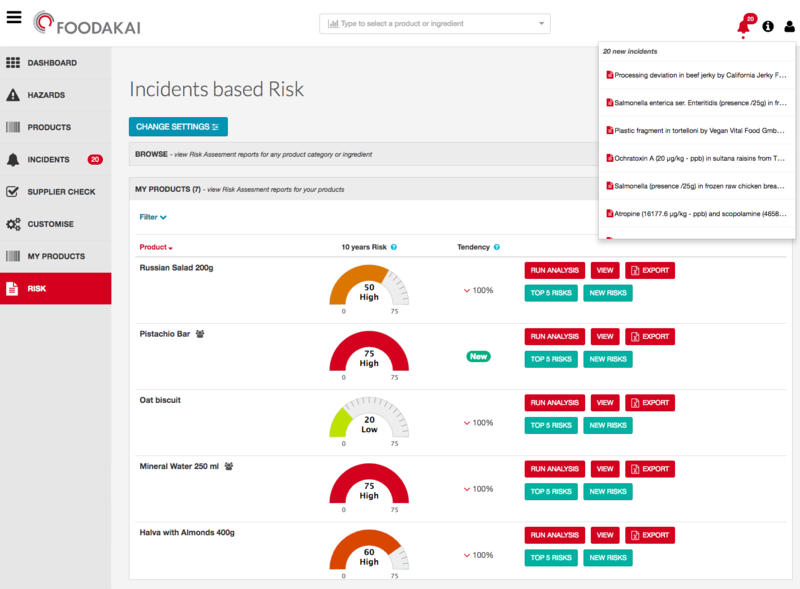 With FOODAKAI you have access to all historical and foreseeable chemical, physical, biological hazards and fraud incidents based on global food safety data that goes back to 1980. Build a robust Food Safety Plan by having access to all the hazards, fraud and adulteration in the global supply chain. FSVP requires an importer to review the food safety history and to evaluate the performance of your suppliers. FOODAKAI provides information for incidents in which suppliers have been involved, including food recalls, citations, warning letters and border rejections. It allows the creation of alerts for suppliers and their ingredients. FSVP requires evaluating the risk posed by a food, based on the hazard analysis of all the raw materials. With FOODAKAI you can have a live risk for all your foods that is updated every time that there are emerging and increasing risks in the global supply chain. Be the first to know about changes in the risk of your foods. Risk estimation is fully documented and you can adjust it to your needs. Our Guarantee: We deliver 100% of all incidents officially & openly published by the authorities. Start your 7 days free trial! No commitments. No credit card needed for your trial.